The urban constituency of Lembah Pantai has 47 divisions, and its crown jewel is the residential and commercial suburb of Bangsar, about 4 kilometres from the city centre. Lembah Pantai has a population of around 172,000, 54% of whom are Malay, 25% Chinese, 20% Indian and the last 1% other nationalities. The constituency's neighbourhoods range from the high-end trendy areas such as Taman Bangsar in Bangsar and working-class areas in places such as Pantai Dalam. Now an exclusive residential area, Bangsar was once a rubber plantation owned by the multinational Socfin, which operated plantations in Africa and Southeast Asia. In the 1960s Socfin sold the land, which was developed into suburbs. The first houses here were built before 1970, in Taman Bangsar (Bangsar Park). The area's new residents were mostly white-collar workers with young families who worked in the city. Bangsar has a prime location: only 15 minutes from the city centre in the northeast and a similar distance from Petaling Jaya in the west. The area has two large shopping complexes and several restaurants, caf�s and boutiques in its commercial district. The street of Jalan Maarof bisects Bangsar, with Taman Bangsar and other neighbourhoods like Bangsar Utama on one side and other trendy areas like Bukit Bandaraya and Bangsar Baru on the other. Residences in Bangsar are varied, from single-family private homes to condominiums and apartment blocks. There's a cultural vibe in Bangsar Baru. The Actors Studio, located at Bangsar Shopping Centre, occupies the former Golden Screen Cinemas lot, hosting plays, comedies and concerts. The area also has a lot of galleries and bookshops, a popular strip where young people like to hang out, and a pasar malam, or night market, in Telawi. Bangsar has quite a lot of graffiti, by Malaysian standards. Some were created by underground artists, but most by run-of-the-mill vandals. There are also roving buskers in certain areas of the district. Overall, Bangsar's residents bridge the social spectrum: from former squatters to middle-class professionals to the business and government elite. 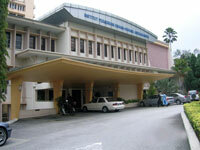 Malaysia's first university, the major research institution of the University of Malaya, its medical school and hospital, are located here. Bangsar does not have a lot of open spaces, except for a few parks and playgrounds. The Circle Line will provide Mass Rapid Transit rail access to Bangsar when it opens in 2010. This residential district caters to the high-end market, with its bungalows, condominiums and apartment complexes, while at the same time offering affordable housing to students, civil servants and the blue-collar employees who make up the majority of the district's population. There are also poorer areas surrounding the upscale neighbourhoods. For a time, Pantai Dalam was more known for its squatter areas, but the district is gradually becoming gentrified. Property prices in places such as Pantai Hill Park, for instance, have risen considerably in recent years. About 2 kilometres southeast of Bangsar, Pantai Dalam is also not far from Petaling Jaya. The district has a high Indian population. The more expensive residences are on hilly terrain, at Pantai Hillpark and Kampung Pantai, overlooking the low-cost apartment buildings and homes. One of Lembah Pantai's most upmarket addresses is Pantai Hill Park, with its low-rise and low-density condominiums. It has become a favourite residential choice of local businessmen, celebrities and politicians. 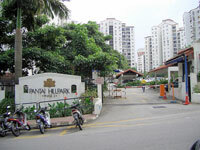 Pantai Hill Park is near equally upmarket homes in Bangsar and Petaling Jaya's Damansara Heights. It is also near a few lower-income areas. The KLCC is about 20 to 30 minutes away by car, and is also accessible by bus and LRT. Since opening in 1997, the development has been continually expanding through 6 phases (areas). In each phase, apartment buildings surround a community swimming pool, which then surrounds a commercial area with exercise and sports facilities, shops and eateries. The on-going final phase, the 16-hectare Pantai Peak, will feature bungalows enjoying magnificent views of Petaling Jaya. Pantai Hill Park's apartment buildings are Mediterranean-inspired in style, with distinctive red roof tiles and white walls. There are a few high-rise buildings. A significant portion of residents are connected with the nearby University of Malaysia and the KL Sentral, Malaysia's biggest train station. Many small cafes and convenience stores dot the friendly, pleasant and vibrant gated neighbourhood, which also has sports and recreational facilities.